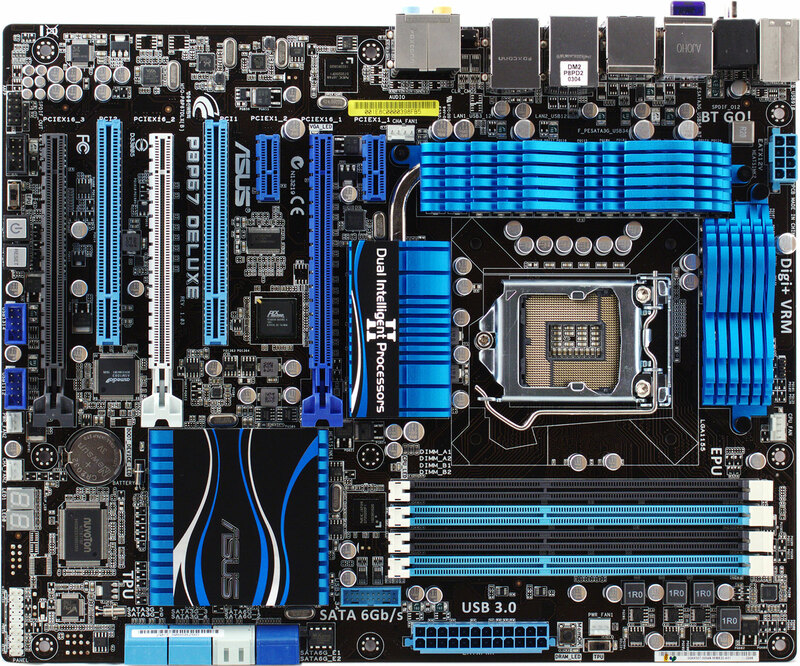 You are probably familiar with ASUS P7P55/P7H55/P7H57 motherboards, a lot of which we have reviewed over the last two years. This time ASUS also followed the beaten path and rolled out a similar feature-rich solution for Sandy Bridge. Enter the P8P67 series. We got the top-end P8P67 Deluxe for review. This quite expensive solution should give you an idea of what the entire series has to offer. It might be not as top-end as the extreme ROG of TUF boards, prices of which are not proportional to functionality. The P8P67 Deluxe is a kind of "regular high-end" solution that you may consider buying, if you actually need all the features it has to offer. If you don't need the second Ethernet controller, additional USB 3.0 headers and some other things, you can save money and go with EVO, Pro or even the budget LE modification. But first let's see what features you'll be losing in that case. At first glance the P8P67 Deluxe doesn't offer any surprises. Unfortunately, ASUS abandoned the reasonable minimalistic cooling system design of the P7P55D series and covered an almost empty spot with an additional heatsink (more on that later). Aside from this, there are few or no peculiarities. Four memory sockets which is natural for a dual-channel memory controller (built into processor in this case). A regular set of expansion slots: motherboards based on discrete Intel chipsets can split a PCI Express 2.0 x16 connection into two x8 ones, so ASUS naturally declares support for both CrossFire and SLI. There's also the third PCIe x16 slot. And since processor just doesn't have enough lanes, it obviously borrows those from the chipset. There's also a couple of PCI slots, although the chipset doesn't support those anymore. The motherboard layout is perfectly reasonable, even despite the top-end nature of the P8P67 Deluxe. Memory modules can be easily installed and removed with the graphics card installed. There are latches only on one end of the socket and that helps too. Power connectors are located in already familiar convenient places. There are many fan connectors and those can actually be reached. Pairwise SATA connectors are horizontal. Additional controls (power, reset, automatic memory mode buttons, POST indicator, etc.) can also be easily reached. And note that there are no IDE and FDD connectors. 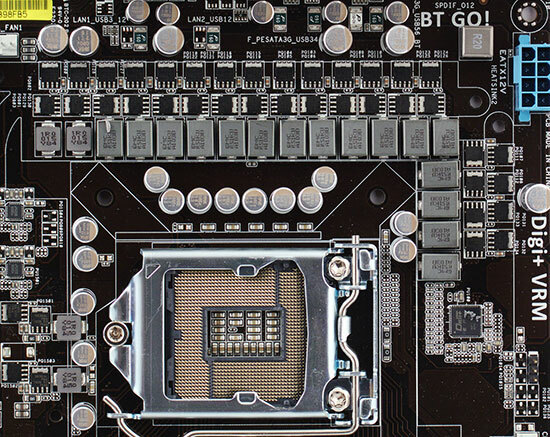 Oh, and if you're wondering, LGA 1155 boards have the same cooler mounting holes as LGA 1156 boards. ASUS has yet to unveil the technical details on power regulation parts it uses, so we'll describe what's on the board. The CPU VRM dubbed Digi+ VRM has 16 "virtual" phases for processor cores, 2 phases for the System Agent unit (memory controller included) and 2 phases for the built-in graphics core. 3 phases for memory modules. Each phase is formed by a couple of MOSFETs. The 16 "virtual" phases most likely work as 8, providing doubled power and twice as better heat dissipation for every phase. Besides, the PWM controller is claimed to be able to balance phase load depending on temperature. Theoretically, this should prolong the life cycle of power regulation parts. Like any other PWM controller that meets the VRD12 specifications, Digi+ VRM can disable unused phases, improving converter's efficiency (energy saving). Again, we have no data on the PWM controller used on the board, so we can but cite the available marketing stories about automatic adjustment of PWM controller frequency and such. You are free to believe those or not. It goes without saying that the P8P67 Deluxe has high-quality polymer capacitors by Nichicon, low RDS(ON) MOSFETs and chokes with ferrite cores. As we have already stated, ASUS couldn't resist the temptation to install a fancy cooling system onto the board. Not only it features heatsinks on MOSFETs (which is reasonable), but also a heatpipe connecting one of those with the third heatsink that covers an almost empty spot. 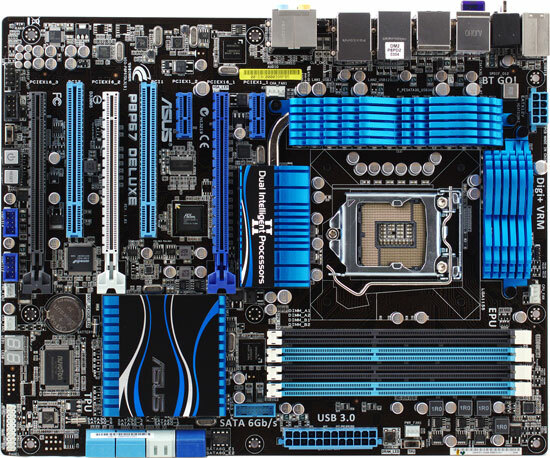 As a result, the motherboard looks like an older solution with a Northbridge that requires much cooling. Obviously, this isn't so, the heatsinks warm up just a bit. It's interesting that MOSFET heatsinks are fixed by plastic latches while the unnecessary one is fastened by metallic screws. Perhaps, there just wasn't enough space for regular plastic latches around that heatsink. On the other hand, we have no serious complaints about the cooling system. All heatsinks are compact and low-profile enough to install a long expansion card. The chipset itself is only covered by a thin metal plate, which is enough for the 6-watt chip. The only drawback is that motherboard heatsinks may make it difficult to install a wide-heatsink CPU cooler with rotating "box-cooler-style" latches. Miscellaneous features include 4 onboard LEDs indicating processor, memory, graphics card and bootable drive malfunctions, respectively. It's interesting that the motherboard also has a POST indicator, so you can choose what's more informative for you. The P8P67 Deluxe also supports the proprietary MemOK! feature that helps install memory modules partially incompatible with the current BIOS settings. When you press the matching button, the motherboard will try to adjust memory clock rate and timings (after setting those to a compatible SPD mode). It can even increase voltage, if needed. As a result, the machine will almost surely boot up with new memory modules and you won't have to reset CMOS.